New York is a state in the Northeastern region of the United States. New York is the 27th most extensive, the 3rd most populous, and the 7th most densely populated of the 50 United States. New York is bordered by New Jersey and Pennsylvania to the south, and by Connecticut, Massachusetts and Vermont to the east. The state has a maritime border with Rhode Island east of Long Island, as well as an international border with the Canadian provinces of Ontario to the west and north, and Quebec to the north. The state of New York is often referred to as New York State to distinguish it from New York City. New York City, with a population of over 8.1 million, is the most populous city in the United States. Alone, it makes up over 40 percent of the population of New York state. It is known for its status as a center for finance and culture and for its status as the largest gateway for immigration to the United States. According to the U.S. Department of Commerce, New York City is also a destination of choice for many foreign visitors. 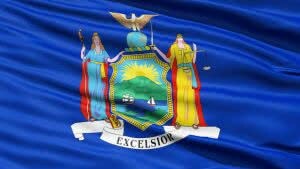 New York is one of our most popular states for incorporation and LLC formation. Names of New York requires corporations should not be confused with any existing entity. Company Express will research your company name to make sure it meets New York’s standards. Required documents: Certificate of Incorporation filed with the New York Department of State. Turnaround time: About 20-30 business days. 24 hours expedited filings are available for an additional fee. Appearance in articles: Director names and addresses are not required to be listed in the Certificate of Incorporation. Time to file: Biennial statement has to be filed during the month that marks the anniversary of incorporation. The state fee is $9. Signature: Director, officer or authorized person can sign annual report. Names of New York Limited Liability Companies should not be confused with the name of any existing entity. Company Express will research your company name to make sure it meets New York’s standards. Turnaround time: About 20-30 business days. 24 hour expedited filings are available for an additional fee. Follow-up filing: New York requires domestic LLCs to publish notice of the incorporation for six consecutive weeks in two newspapers as assigned by the County Clerk in the county of the LLC’s legal address. A Certificate of Publication should then be filed with the Department of State upon completion of the publication requirement. Time to file: Biennial statement must be filed during the month that marks the anniversary of organization. Signatures: A manager, member, authorized person or Attorney in Fact may sign reports.